· Bring one cup of water to boil, add dried osmanthus and sugar into it and place a lid on the pot, boil at medium heat for 5 minutes stirring occasionally. Remove from heat and let osmanthus to soak for 10 minutes. · Strain osmanthus and bring osmanthus tea to boil again, add soaked gelatine and 2 tbsp osmanthus jam, mix well till gelatine dissolved. Leave osmanthus tea to cool and pour in fresh milk - stir well. 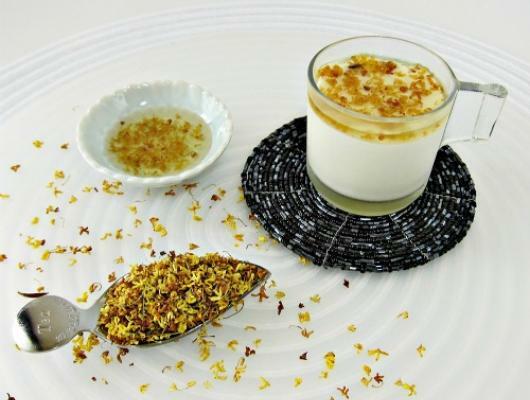 · Whisk topping cream to peak form and mix into the osmanthus tea mixture with a hand whisk. 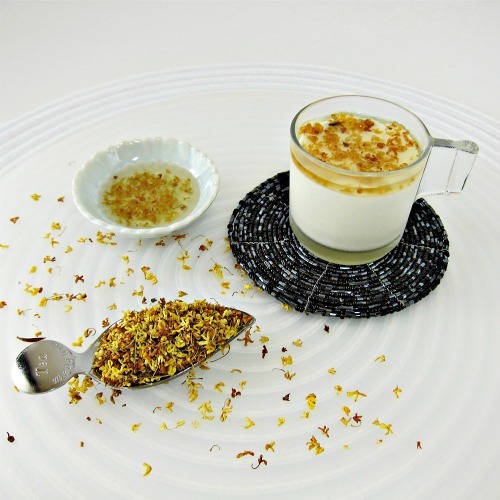 · Divide osmanthus tea mousse among small glasses. Refrigerate for about 2 hours. · Add 1 teaspoon of osmanthus jam on top of osmanthus tea mousse when serve.